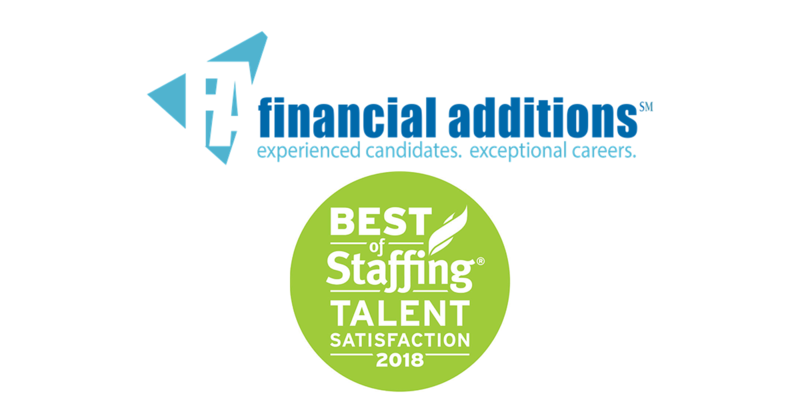 Dallas, TX – February 15th, 2018 – Financial Additions, a leading employment agency in the Finance & Accounting Industry announced today that they have won Inavero’s Best of Staffing® Talent Award for providing superior service to job seekers. Presented in partnership with CareerBuilder, Inavero’s Best of Staffing Talent winners have proven to be industry leaders in service quality based entirely on ratings provided by the permanent and temporary employees they’ve helped find jobs. Less than 2% of all staffing agencies in the U.S. and Canada have earned the Best of Staffing Award for service excellence. Focused on helping to connect people with the right jobs to further their career, Financial Additions received satisfaction scores of 9 or 10 out of 10 of their placed job candidates, significantly higher than the industry’s average of 45%. About Company | With over 19 years of proven excellence in our industry, Financial Additions continues to provide quality in finance and accounting talent to top companies. We recognize that our success stems from the relationships that we build, and we strive to deliver an exceptional experience. Visit www.financialadditions.com for more information. ⟵We moved! Financial Additions is excited to join Fort Worth’s newest hub!